Spent yesterday, Saturday, spending lots of money. Drove Uma, the URRV over to Les Schwab where they confirmed that the tire warranty that came with the tires follows the owner who purchased them so no prorated refund. Still, their service and timely work proved impressive to me. I think I'll be giving them all my tire business from this point on. They let me hang around, as they worked on the RV in back of the tire shop. The bay was big enough but I guess it was easier and the weather was nice so why not? The tires the P.O. had installed before (also by Les Schwab) were their top of the line tires for the kind of driving I like to do: not only pavement but cross country as well. The spare tire was too old, showing small hairline cracks so it got replaced as well. A 3.5 Ton Bottle Jack is OK to use on the front tires. The rear axle can be lifted using a 12.5 Ton Bottle Jack. This means of course, the 5 Ton jack I have in the RV comes in handy only for the front tires. The tires I bought are supposed to be 60,000 mile tires, I think I'll be doing good to get 30,000 miles out of them, what with the loads imposed by RV duty and all. Air powered tools are really nice. Tires were last replaced by P.O. at 18,750 miles. Mileage on Uma as 46,100 so the tires were replaced at 27,350 miles give or take a few. Not bad, and as I mentioned before, the tech at Les Schwab did say they old tires still had some wear left in them. On the first visit, I had them replace the two front tires, and the left side duallies along with the spare tire. Two young techs worked on Uma and were methodical but fast and took no shortcuts. I like that. 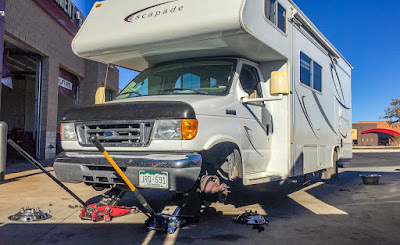 I drove Uma back to the storage yard and realized I should have brought the trailer along to have its tires replaced since they were even more worn than the RV tires. Instead of schlepping the RV back with the trailer in tow, I removed both tires from the trailer at the storage yard and took them over in Scarlett, my 2014 Patrol Sidecar rig. The expectation was I would dropped them off, as things were picking up for them in terms of customers, and they'd call me back hours later. I show up, the guy I talked to on the phone walks up to me, grabs the tires and proceeds immediately to swap in new tires! He was moving so fast I thought he was being timed by his boss or something! In less time than it took me to remove the wheels, he was done and I was out of there.....very pleased. Yep, I'll be giving them my business. Today, Sunday, spent more money. I went and bought a replacement generator to replace the ailing Honda 1000 watt generator. 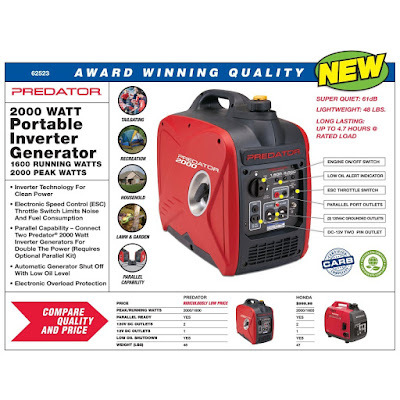 There was a sale coupon for the Harbor Freight Predator 2000 watt generator so I bought one. Why? The Honda generator needs (I think) a piston ring replacement job. I found the spark plug fouled with oil and there was lots of it coming out of the spark plug hole while I was doing some troubleshooting. Replacing the spark plug did the trick to get it running again but she's definitely burning oil big time and is blowing lots of smoke at startup. It's heavier than the Honda 1000 but then again, double the capacity. This unit competes against the Honda 2000 unit, and is almost 3 lbs heavier than its competitor. (but half the price). Peaks at 2000 watts, normal load should be less than 1600 watts. Supposed to run over six hours on one tank of gas (1.2 gallons) in Eco mode. Has a fuel level meter, we'll see how accurate. About as loud as the ageing Honda 1000, much quieter in Eco mode than in full mode. 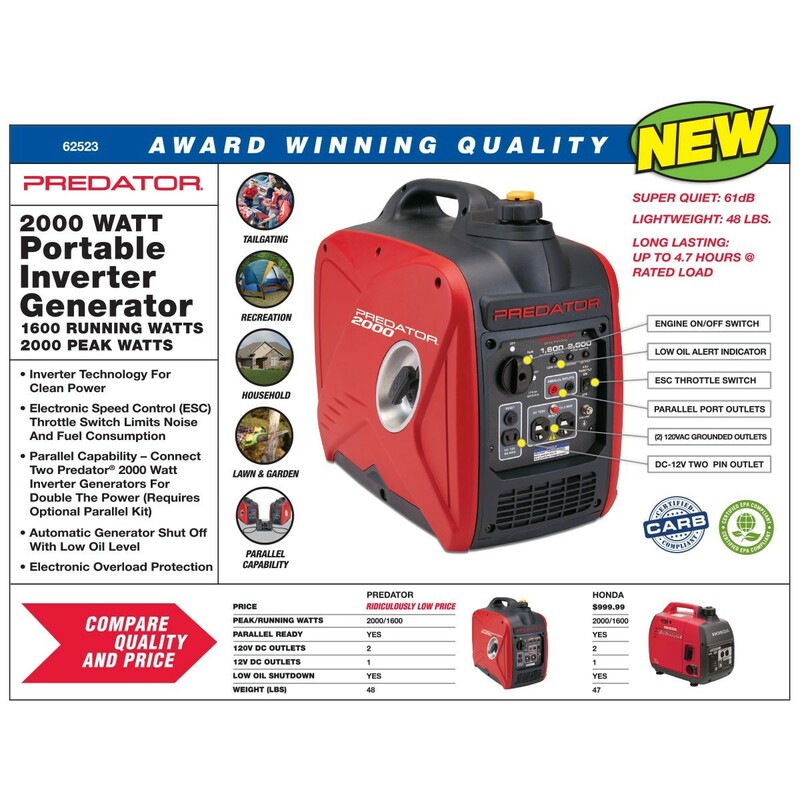 I'll be putting this generator through the paces in upcoming camping trips, more to follow to be sure. It'll be interesting to see how the economy compares to the Honda. You seem to get great service everywhere, Dom. Good Karma coming your way. Sorry when I missed the respective information before but what is such a generator being used for? I hope the economy justifies it RichardM. 6 hours per gallon on low power which is usually all I need. SonjaM, basically this generator tops off the house battery on those days when the solar panels and the weather couldn't do it and power my electronics during the day. Though the 100 watt panel is not enough to do both, it seems to keep the electronics running/charged without draining the house battery to much. Its just more economical to run than the onboard 4KW generator the RV comes with....that one uses .7 gal/hr on low loads....but its only used when AC or microwave use is required. The 2000 watt generator seems to handle the microwave just fine as they are in the 1000-1200 watt range. The A/C would probably work if an EasyStart is installed. This lowers the surge current needed when the compressor starts up. While running, the A/C draws about 12 amps or about 1300 watts.